The next sections will guide you on how to trim a file in Steno. 1. Go to the editing page for a file. Then tap the the "More" button in the top lefthand corner. After that an option will pop up that includes trimming the file. 2. When you tap trim on you will get a box with a control on the right of the waveform, and a control on the left of the waveform, and a filled in box in between them. The options to trim or cancel will also appear. Canceling will dismiss the trimming mode and return you to the normal editing mode. 3. 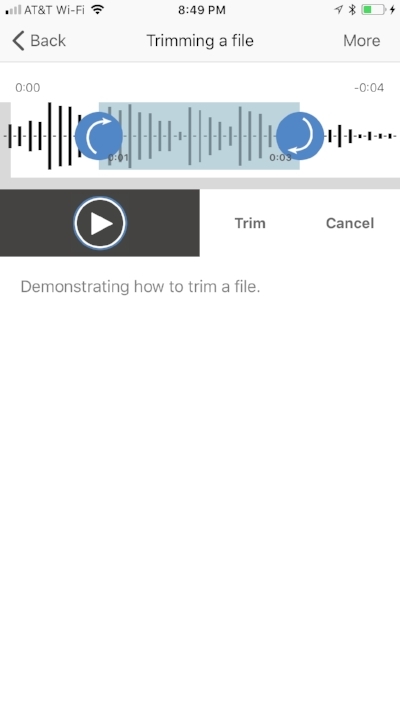 Tapping the trim button will create a new audio file, along with the accompanying transcript. The new file created by trimming will begin at the time displayed at the bottom left of the trim box (near the bottom of the left trim control), and the new file will end at the time displayed at the right side of the trim box (near the bottom of the right trim control. So in the image below, we will trim the current file by creating a file that starts at 1 second and ends at 3 seconds of the 4-second file. You can touch and drag the circular trim controls to make the new, trimmed file start and stop where you want it to. 4. Once successfully trimmed, the app will take you to back to the list of files where the newly trimmed file will be show at the top of the list with the word "New" in front of the title of the original file. 5. Our newly trimmed file contains the audio from the original at the start and stop times we decided, and contain the words in the transcript that were connected to the audio we trimmed. We did it!